Presence, immediacy, naturalness: Mobile Fidelity reissue makes Blood on the Tracks among most lifelike-sounding albums you'll ever hear! Michael Fremer Rated 10/10 Music, 9/10 Sonics in .analogplanet.com! 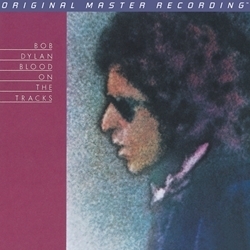 As part of its Bob Dylan catalog restoration series, Mobile Fidelity is thoroughly humbled to have the privilege of mastering the iconic LP from the original master tapes and pressing it on dead-quiet LPs at RTI. The end result is the very finest, most transparent analog edition of Blood on the Tracks ever produced-and the first-ever proper analog reissue. Fantastically presenting both the solo acoustic and band-supported songs with the utmost clarity, dynamics, presence, immediacy, spaciousness, imaging, and balance, this version shines a high-powered light on the fluid vocal phrasing, timbral shifts, functional rhythms, and inward-looking strumming that contribute to every song here serving as a wound-exposing confessional. For all the melancholic pain, unresolved questions, shattered memories, wasted times, unrequited dialogs, and weary regret within, Blood on the Tracks remains as daring as it is reflective. Rather than follow for a monotone caustic vibe, Dylan's songs burrow into the subconscious for the manners in which they are even-keeled, mellow, and occasionally, even peaceful. Dignity, honor, poignancy, and fairness-all traits uncommon in any situation in which partners dissolve histories, change hearts, and attribute blame-instill the record with equilibrium on par with the consistency of the flowing melodies. Throughout, tunes come on and proceed as if they could continue forever, Dylan spinning poetic verses and conversations amidst finely tied knots of acoustic notes, chords, and fills, the deceivingly simple architecture conjuring the intertwined refractions of a bezeled jewel, various angles, colors, and textures conjoining into a gorgeously inseparable whole. Backed by Tony Brown's flexible albeit subtle bass, Buddy Cage's country-streaked pedal-steel guitar, and Paul Griffin's soul-baring organ-an instrument used to shadow, tuckpoint, and illuminate here as effectively as any time in rock history-Dylan pours soulful emotion, open his veins, and bleeds. Given the sonic and artistic merit of this album, we anticipate huge demand.